Pool slides were arguably the most divisive shoe trend in 2016, as these rubbery, sporty sandals became the latest "ugly" shoe to go mainstream. While you might be certain that you will never ever wear a pair of sporty branded sliders (often paired with an obligatory white sports sock too), 2017's take on the idea might make you change your mind about them altogether. 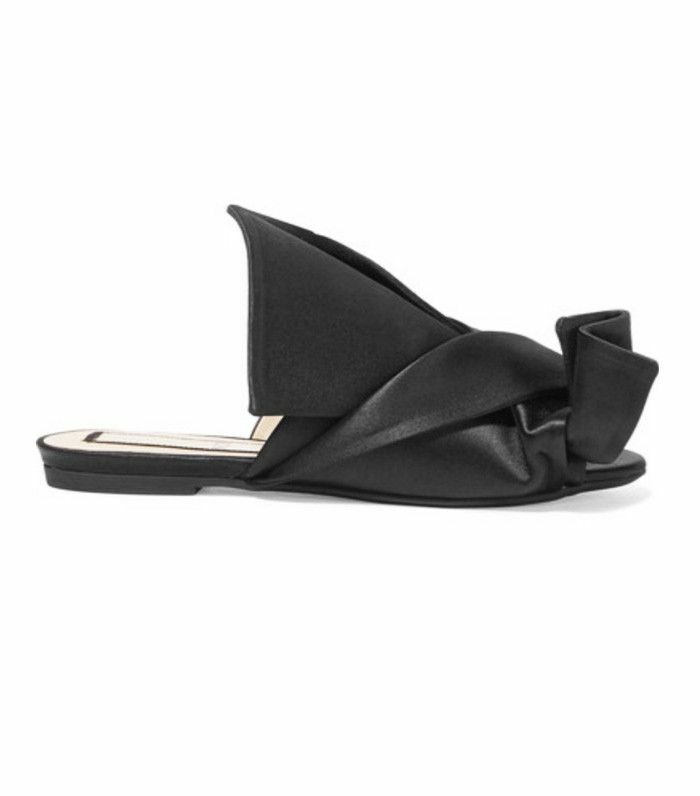 This season, they've had a complete makeover, with the likes of Balenciaga, Topshop, No.21 and more creating satin sliders with bows on the toes. This sandal is no longer limited to ugly ridged rubber soles and sports brand logos; slides 2.0 are adorned with feathers, embellishments and pretty touches. Comfort + decoration = the dream footwear combination, right? Scroll through the gallery below to shop our edit of the nine best pool slides. No.21's knotted sandals are perhaps the most sought-after sliders this summer. Topshop's satin bow sliders are under £20 and available in pink and khaki. The crystal watermelons on these leather sliders are just screaming to be Instagrammed. Brother Vellies uses traditional Ethiopian shoe-making techniques. Balenciaga—the brand kick-starting the majority of the most significant trends in 2017—has created knotted satin slippers in black, white and lavender. Rihanna is behind the bow satin slider trend, as they are one of the key shoes in her latest Fenty x Puma collection. Prada has created delicate satin sliders with a dainty bow at the front—no one would dare to call these shoes "ugly". If you are looking to make a real statement with your sliders you can't beat these feather- and jewel- adorned Miu Miu sandals. These are the perfect mix of sporty and luxe, with the white rubber ridged sole and dusty pink satin ruffles across the toe. For more shopping, see the 11 new-in pieces that are bound to sell out this week.